One of my old friends, now late of this world, once told me his mother always wanted him to be a journalist, but he ended up a piano player in a New Orleans brothel anyway. Well, in the old red-light district of New Orleans at least, if not exactly in what Jeff Noble preferred to call a "knocking shop". And not before Jeff had had a very long and quite distinguished career in newspapers, one upon which he embarked as a young man in a hurry and at the cost of a chance to sprint for Australia at the 1956 Melbourne Olympic Games. Like me nine years later, Jeff had taken up an early December end-of-college year cadetship in journalism, thus denying himself the chance to compete against the legendary Bobby Joe Morrow, the Texan flyer who was dubbed "The Fastest Nice Christian Boy in the World". It might have been an interesting clash: Jeff could never have been called "nice" and wasn't especially Christian either. But while his track days may have been ended, Jeff still cherished the idea of attaining the badge of honour about the journalist and the brothel piano player, of being a Jelly Roll Morton rather than a Quentin Reynolds. He reached the point in life where he could afford to spend his annual leave in Louisiana, making Rue Bourbon his Mecca and haunting the seedier streets of "The Big Easy" and, over time, befriending the people who would secure for him the job of his dreams. He eventually got to settle in the north-west of the French Quarter, beautifully positioned in Gretna, twixt Basin and Dauphine streets. From there he sent me a postcard, saying how thrilled he was that Leonard Cohen had described “The moon stood still on Blueberry Hill” as the one immortal line from song. “You just see that full moon suspended. You just want to gaze at it. It stops the mind spinning,” Cohen had said, in a sound opinion he was to repeat more than 20 years later. Jeff added, "It's a line I wish I'd written myself." It was actually written when Jeff was aged just one, by Larry Stock and Al Lewis. 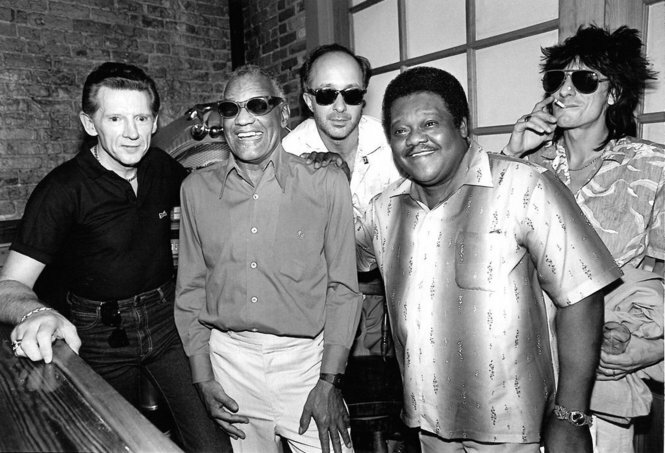 From left, Jerry Lee Lewis, Ray Charles, Paul Shaffer, Fats Domino and Ron Wood at the Storyville concert on June 5, 1986. Thursday, June 5, 1986, was my second son's first birthday in Brisbane, but I was visiting Jeff in New Orleans, and we went to the Storyville Jazz Hall at 1104 Decatur Street - right in the heart the old bordello district - and chanced upon an evening when someone fell ill and Fats Domino was joined on stage by my hero, Jerry Lee Lewis, and Ray Charles, and by the Rolling Stones' Ron Wood on guitar. Seeing such giants of popular music in the flesh - I had first heard Domino, Lewis and Charles on scratchy 78rpm shellac resin discs in the mid to late 1950s - was as wonderful as it had been unexpected. 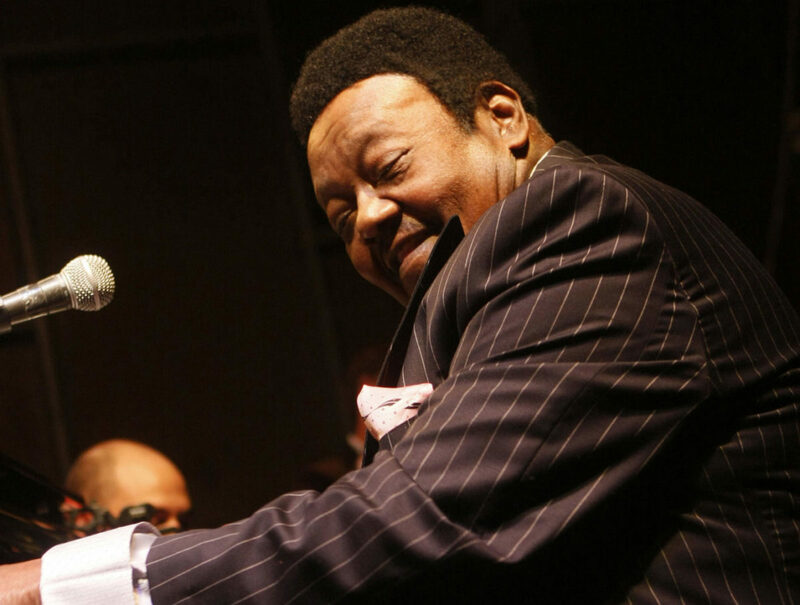 Antoine Dominique Domino Jr's death in Harvey, Louisiana, on Tuesday of this week, aged 89, brought fond memories of that fantastic "Fats & Friends" concert flooding back from 31 years ago. Indeed, I hadn't thought about it much in a decade, since December 2007, when I reflected on my own then 42 years in newspapers, still convinced I'd have to be dragged out of a newsroom in a wooden box. It never came to that, happily, but it did for some of the unforgettable characters with whom I'd worked, including Jeff Noble. What I remember Jeff best for was the night he commandeered the piano in the restaurant at The Metropole on Wickham Terrace in Brisbane and belted out Louis Jordan’s Let the Good Times Roll for the right royal entertainment of four-minute miler Sir Roger Bannister, among many others. We all, it seemed, loved Louis Jordan. But no more so than Fat Domino, or any of the other great "rockin' piano" players. The first time I saw that badge about “My mother thinks I’m a journalist but actually I’m a piano player in a brothel”, it was beside another one someone had written, one which read, “My name is Robert Messenger and I’m wearing this badge because I'm suffering from a colossal identity crisis”. I can’t recall the occasion, but I just can’t shift the image of those badges from my mind. If I’d known then and all that … I’d have gotten out of the crazy, family-life-killing profession of newspaper writing and become a meat packer instead. The more so if I'd ever been able to grasp that I revered the printed word far more than I did my own family. I should have taken the hint, I suppose, when I was called a "prima donna" for complaining about a change a sub-editor had made to a story I'd written at The Irish Press on Burgh Quay in Dublin in 1974. Or upon being accused, seven years on, at Cowes on the Isle of Wight, of being too "precious" about my choice of adjectives. 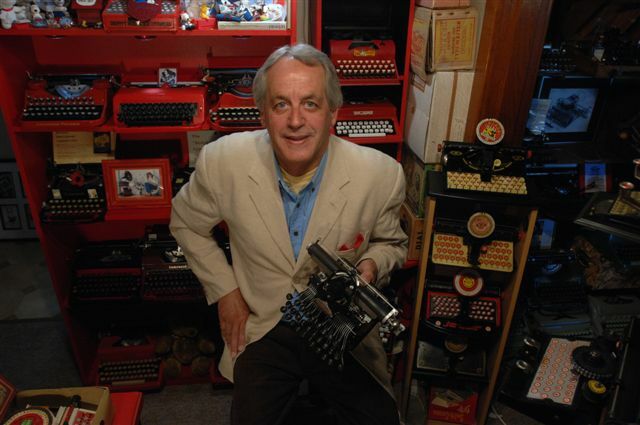 It was 10 years ago last March that my friend John Coffey, who comes from the same town as me, was sacked by The Press in Christchurch for telling his sports editor, Coen Lammers, to leave "his f...... copy alone" because "he always f...s it up". The New Zealand Employment Relations Authority found John's dismissal had been "fair". Coffey was one of New Zealand’s leading sports writers for 44 years. Such treatment would never have been meted out to Sir Neville Cardus, who in anger over a mild rebuke about wasting words, return cabled the (then Manchester) Guardian from the Marylebone Cricket Club's tour of Australia in 1937, “I’ll send punctuation, you insert f…… words.”. We didn’t all turn out to be Carduses, sadly. I’m not entirely sure what my mother wanted me to be. Like Cardus’s unwed Manchester mother – a "genteel prostitute" – I fancy she desired something other than a miner or a wharfie for a son. When my mother was pregnant with me, she had her tea leaves read and was told certain things about what I’d be, none of which came within the proverbial of what I became. Let’s just say I never became the genius she was confident I'd turn into. I think my parents probably thought journalism was an honourable profession. I know the fathers of certain female friends made the mistake of thinking I'd be a desirable "catch". “How far will he go?” one asked my then editor in what he thought was confidence, 40 odd years ago. “How much will he earn?” Little could the editor have known what a mess it would all turn out to be. Nonetheless, that rightfully concerned father, a publican with a piano in his bar and a red light out the back, did get himself a journalist for a son-in-law. A good one, too, the offspring of a miner and a proper homemaker. One who would became editor of the New Zealand Press Association and who had the good judgement to flatten the now (as of last week) Deputy Prime Minister of New Zealand, Winston Peters, in the press bar of the "Beehive", New Zealand's Parliament House in Wellington. By contrast, my life seemed in December 2007 to be more reminiscent of the experience of then Australian National Party deputy leader Nigel Scullion, whose wild night out in St Petersburg was predominantly peopled by Icelandic whalers and Canadian crab fishermen. Yet nowhere on my travels, happily, was I reduced to playing piano in a brothel. For one thing, like Bob Dylan when he was washing diner dishes by day and playing in Bobby Vee’s band The Shadows by night – as Elston Gunnn (yes, three “n”s) no less – I can’t play piano. But one time, covering cricket in Kalgoorlie, I organised an early evening tour of the gold mining city's notorious red-light district, Hay Street. This is a little less salubrious than Bourbon Street, yet I was joined by some notable Test cricketers, Barry Richards included. When I mooted the idea, I got so many recruits so quickly that a colleague yelled out, “Geez, Messenger, you’re better than Kerry Packer at this!” As we boarded our plane that night, it was noted some of my little band of rebels were missing. No doubt they were playing piano in one of Hay Street's many seedy brothels. Yet another typewriter has featured in Google's doodles. 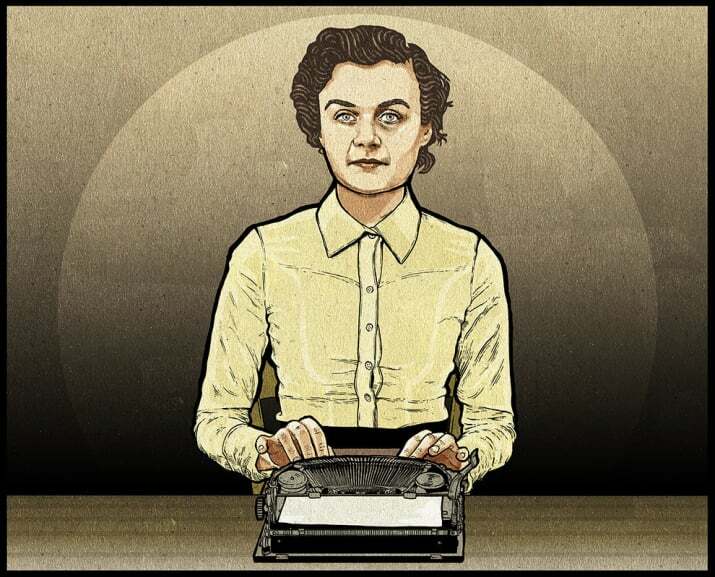 Today's doodle marked what would have been the 106th birthday of British journalist Clare Hollingworth, who was the subject of an ozTypewriter blog post almost exactly a year ago, on October 11, 2016. 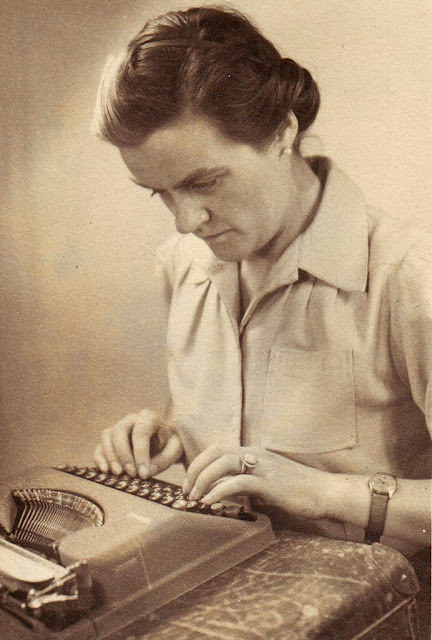 Hollingworth, who went on to report on conflicts in Palestine, Algeria, Iran, Egypt, Pakistan, China, Aden and Vietnam, said she would "happily go anywhere with just a toothbrush and a typewriter". But that typewriter was most usually a Hermes Baby portable, not a standard as shown in the Google doodle. 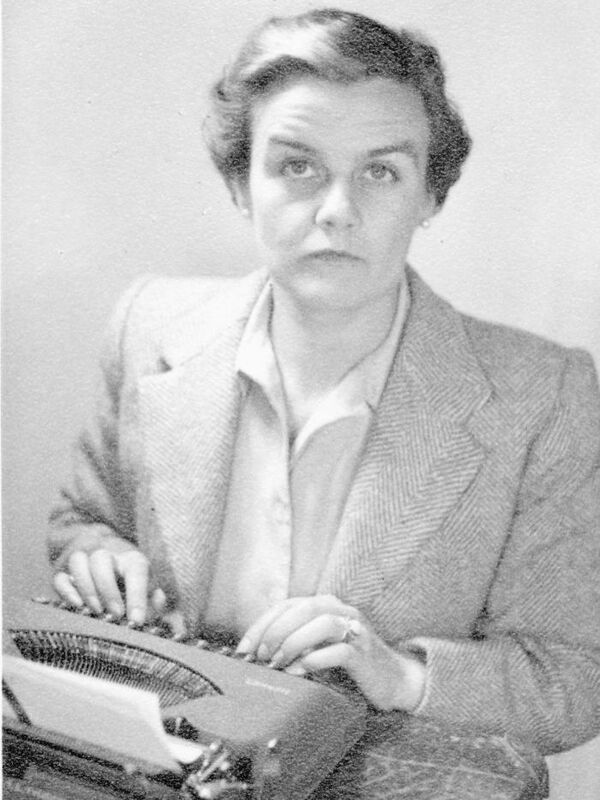 Hollingworth was born in Knighton outside Leicester, home of the Imperial typewriter, but she generally used the Hermes. Hollingworth died in Hong Kong on January 10 this year, aged 105.